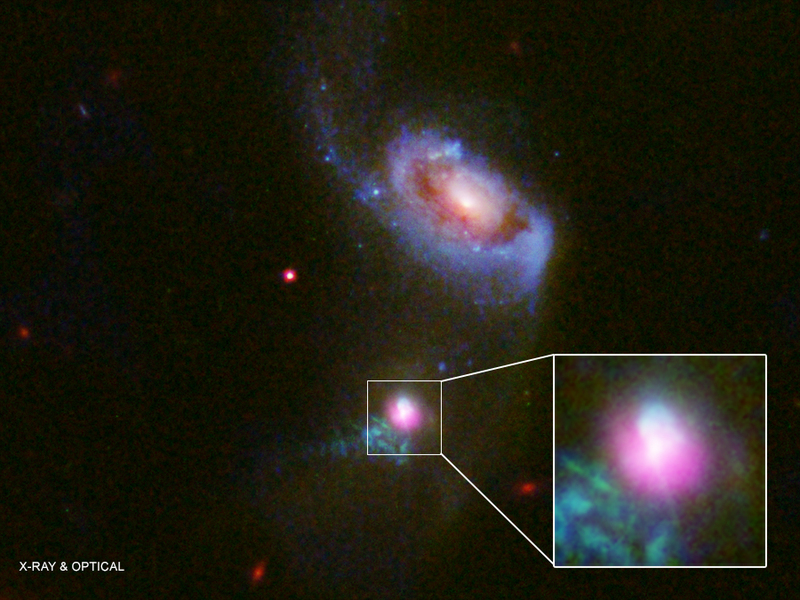 A rapidly growing black hole — known as an active galactic nuclei — has been seen turning off and then on again. This supermassive black hole is located in the galaxy nicknamed J1354 located about 800 million light years from Earth. By combining X-ray data from Chandra with optical telescopes, researchers traced the black hole's behavior. The evidence shows that the black hole "snacked" twice on occasions separated by about 100,000 years. I always read your page. It's very educative. I teach physics in secondary school and mention to my students how interesting your work is. Thanks and keep the fantastic work you all do there. We know from physics that black holes can absorb every thing even light and nothing can escape from it.. so in this case what does exactly mean when we say black hole burping? Thanks A lot for all these valuable information. A rapidly growing supermassive black hole. About 800 million light years away. The inset image is about 13,000 light years across. The full field image is about 160,000 light years across.